WASHINGTON, D.C. -- More than half of American investors (55%) use a personal financial adviser (PFA). Investors who use a PFA are more likely to have confidence in their investment plans and in their own knowledge of stock investing than those who handle their own finances. A solid majority (61%) of investors who work with a PFA strongly agree that their investment plan is on the right track, in comparison to 41% of investors without a PFA who feel the same. Additionally, investors with a PFA are more likely to see themselves as able to handle the next stock market correction -- something that more than half of all investors (54%) expect to occur before the end of the year. They are more than twice as likely to have a written plan to guide their financial decision-making -- 68% vs. 28%. More than eight in 10 investors with PFAs (86%) say they maintain an investment portfolio that is diversified "across different industries, asset categories and risk levels," compared with 63% of those without PFAs. Just over half of investors with PFAs (54%) say they rebalance their investment portfolio (buying or selling funds in order to restore the portfolio to its original asset allocation) at least once a year. This compares with 33% of those without PFAs. Further, investors with a PFA are more likely than those without one to give themselves a grade of A or B on their own knowledge of stock investing -- 44% vs. 32%, respectively. 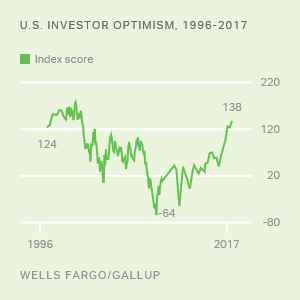 The findings are from the third-quarter Wells Fargo/Gallup Investor and Retirement Optimism Index survey, conducted July 28-Aug. 6. The survey reflects the views of U.S. investors with $10,000 or more invested in stocks, bonds or mutual funds. About half (51%) of all investors do not take the basic step of creating a written plan to guide them in their financial decision-making. A similar proportion (51%) rebalance their portfolio only every few years, if at all. About one-fifth say their portfolios are not diversified. Twenty-two percent say they could tolerate taking more risks with their investments than they currently do. In avoiding such risks, even though they could tolerate them, these investors are potentially denying themselves additional income. Investors are more confident in their investing and are more likely to take solid investing actions if they use a personal financial adviser. Regardless of whether this is because an active, confident investor is more likely to hire a PFA or because an investor who uses a PFA is therefore more confident and more active, it is clear that having a PFA is linked to positive investment actions and attitudes. In spite of the connection, many investors, including higher proportions of those who grade themselves poorly on personal knowledge of stock investing, choose not to use PFAs. The choice to "go it alone" is only one of a number of decisions American investors are making that leave them underutilizing or ignoring altogether some of the most basic financial tools and strategies. 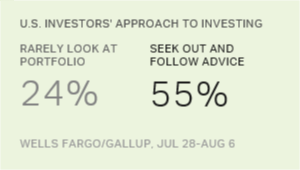 A majority of U.S. investors describe their investing approach as seeking out and following good advice. A quarter are self-admitted "snoozers" who rarely look at their portfolio.